Check out Different Types of Milk Shakes. We are giving here famous, Tasty, Unique Milk Shakes Recipes so that you may prepare the delicious drinks at home. Monsoon is here and the summers are over, but the milkshake season isn’t! You can make some delicious milkshakes at home and you don’t need to travel in the muddy roads to get it. Here are some mouth-watering recipes that you can make at home. You will need a juicer, a hand-blender or a shaker. Each of the following recipes serves one, just double the ingredients if you want to make more. Find different types of Milk Shakes Recipes. Prepare Milkshake at home. You can also place an online order for Milk Shakes at your favorite CCD Restaurants at the discounted price by using Swiggy Coupons for Existing Users at CashFry. There are Swiggy Coupons for New Users as well. Blend 1 cup of vanilla ice cream, 2 tablespoons of milk, less than a pinch of salt, ½ teaspoon of vanilla essence and ice cubes in the juicer. Top with a scoop of vanilla ice cream and some chopped almonds if you like. It will freshen you up instantly! Take one large mango (chopped), 3/4th cup of milk, sugar to taste, ice-cubes (optional) and blend them in the juicer. You can serve with a scoop of vanilla ice cream and chopped tiny pieces of mango for an extra touch! This milkshake is not only tasty but also healthy and filling. In the season of Muskmelon, Cafe Coffee Day has Musk Milkshake. For other plenty of beverages, you can check out ‘Coffee Day Menu’ as the links given above. Blend ½ cup of milk, 1 tablespoon of hot water, 2 scoops of vanilla ice cream, 2 teaspoons of coffee and 1 tablespoon of chocolate powder or Hershey’s chocolate syrup. You can put more coffee or more chocolate powder depending on how strong you like it. Take ½ cup of milk, 1 tablespoon of hot water, 2 scoops of vanilla ice cream, 1 teaspoon of coffee, 1 tablespoon of cocoa powder or Hershey’s chocolate syrup, 2-3 crushed Oreos and blend them in the juicer. Add 2-3 tablespoon of sugar if ice cream is not available. Take 3-4 freshly chopped ripe strawberries, ¾ cup milk, ¾ cup vanilla ice cream or strawberry ice cream and 1 teaspoon honey or sugar for taste and blend them in the juicer. Top with a scoop of ice cream and some finely chopped strawberries. Add 1 cup of milk, 1 and a half tablespoons of Rooh Afza syrup, a ¾ tablespoon of sugar and 1 teaspoon of basil seeds(optional) in a glass and stir well. You can alter the syrup’s quantity depending on your taste and add a scoop of vanilla ice cream or ice cubes while serving. If you do not want to pay for delivery charges at Swiggy, there are Swiggy Free Delivery Coupons at CashFry. Blend 1 cup chocolate ice cream, 2 tablespoons milk, 1 tablespoon sweetened condensed milk, a pinch of cinnamon(optional) and ice cubes in the juicer. Sprinkle raw sugar(turbinado) on the top and serve! Add 1 cup of vanilla ice cream, ¾ cup of Nutella and 2 tablespoons of milk and to the juicer. Blend it as it is or you can add sugar to taste. Garnish with a scoop of vanilla ice cream and tiny chocolate pieces. If you are a New User at Swiggy, there are Swiggy New User Offers. Existing users, you can check out Swiggy Coupons for Existing Users. Take 1 cup of chocolate ice cream, ¼ cup of milk and ¼ cup peanut butter in the juicer and blend with some ice cubes. Garnish with some chopped honey-roasted peanuts for a rich taste. Blend one cup of frozen blueberries, ½ cup of vanilla ice cream and ½ cup of milk in the juicer until smooth. Top with a scoop of vanilla ice cream or 2-3 freshly chopped blueberries and serve right away! These amazing different types of milkshakes will make your monsoons much cooler and tastier. Take care that too much of everything is bad. Milk Shakes can increase your Triglycerides level. 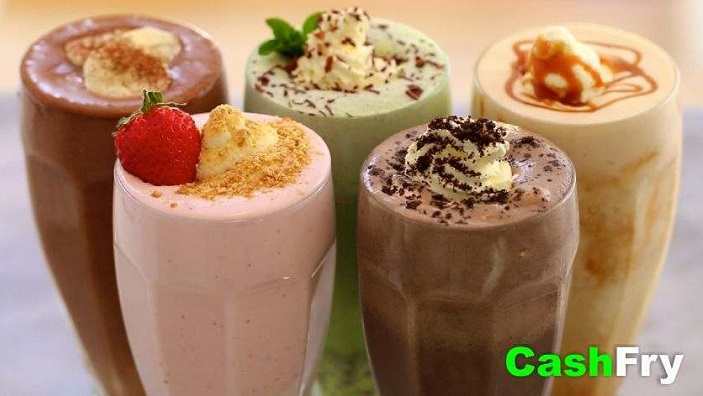 You can get a variety of Milk Shakes at CCD, the Cafe Coffee Day. It is a popular range of restaurant. Priya is studying Literature, English at St.Josephs Degree & PG College, Hyderabad. She is very Creative and writes Articles for CashFry. What is Green Tea? | Benefits of Green Tea & How to make it? Designed by CodetoRank.com. © 2019 Cashfry Blog. All Rights Reserved.